To best understand what the Wacom Inkling is, we should start off with what it’s not. The Inkling won’t replace (or substitute for) a Bamboo, Intuos ( ), or Cintiq ( ) tablet. It’s not a tool for making final inks. And if you’d rather write than draw, the Livescribe’s ( ) the pen you want. So what is the Inkling? It's a terrific sketch partner; a scanner replacement for first-draft doodles; and a surprisingly capable pressure-sensitive pen. Wacom’s first experiment in multi-form capture technology works like this: Clip or place the Inkling’s small receiver (it’s about the size of a AA battery pack or a Zippo lighter) on the top, bottom, or side of your paper page, and switch it on. Then draw, doodle, and sketch with the included pen. The receiver records all your penstrokes via line-of-sight to its built-in 2GB flash drive. This process works astoundingly well: I was doodling mere minutes after taking the Inkling out of its packaging. I had only to turn on both receiver and pen, and they recognized each other instantly, letting me get right to work. If you want, you can tweak pen and receiver settings within the Sketch Manager app before getting started. For example, you can calibrate the pressure of your pen and the ballpoint diameter; signal the angle at which you want to place your receiver on the paper; and choose the size canvas you want, but I chose to dive in without worrying about calibration, and got impressive results. 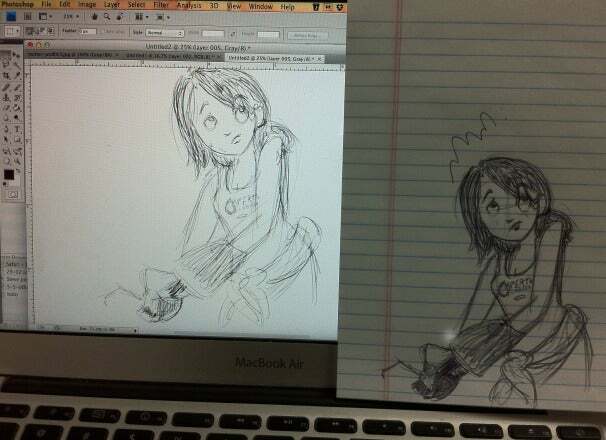 Thinking with portals: On the left, the Inkling's import; on the right, the original drawing with the pen. The first test sketch I made—a 10-minute doodle of Chell, from the Portal franchise—imported almost line-for-line, minus some facial detail work I attempted toward the end. Like most other digital drawing products, the Inkling does best when your drawings are larger: You’re likely to capture many more line subtleties drawing a face on an 8-inch scale than on a 1- or 2-inch scale. Sloppy writing: The Inkling receiver can't detect lines on a smaller scale as well as it can when working with longer strokes, making it ill-suited for casual note-taking. Because the Inkling works via infrared technology, you can occasionally run into line-of-sight or canvas adjustment problems. In theory, after you clip the receiver to the page, it looks for the tip cage of the pen to cross its field of vision. When you make your first line by pressing the tip onto the surface, the receiver captures it, and places the stroke on its virtual canvas (defined by whatever you set up in the Sketch Manager app, or A4 by default). However, if you block the receiver, cover the pen tip, or draw too close to the sensor (within 2mm), the Inkling can’t record the line. Additionally, if you jostle the receiver, it will redefine your virtual canvas area: During my second sketch, I accidentally bumped the receiver with my hand; though it didn’t seem to move from its original position, I ended up importing a sketch with half its lines on one side of the virtual page, and half on the other side. Readjustments: If you accidentally hit the Inkling receiver, you may wind up with your lines in two different places on the virtual canvas. Another physical problem I encountered was Wacom’s helpfully-added-but-perhaps-not-quite-perfectly-placed Layer button. On your computer, before you export your drawing from the Sketch Manager app, you have the option of creating time-lapse layers from your lines, so that you can separate misplaced lines or certain features from the main drawing. Now, you can do the same thing during a drawing by pressing the Layer button—which happens to be on the right side of the receiver. And, unsurprisingly enough, when you press the button, the receiver moves ever so slightly, throwing off the virtual canvas. It would have been better to find a way to add that button to the pen itself—the less interference with the receiver, the better. Once I discovered these little quirks, however, they became easy to avoid. If your fingers get in the way of the receiver, you can easily move it to a different side of the page; and because you can add layers in the software, I rarely worry about making layers mid-drawing. And while the receiver’s finicky about being physically bumped, as long as it’s securely attached to the canvas you’re using, I found no problem drawing at a raised angle (on my lap, say) or rotating the page to add a detail. Sure, it takes a little getting used to, but the adjustment period was much shorter for me than my first experience with drawing on a Wacom tablet or an iPad. The output really is quite spectacular. Though the pen isn’t the best for writing (see my earlier comment about the Inkling’s receiver not accurately recognizing small details), it’s a wonderful tool for first draft sketches. If you work entirely in vector programs like Illustrator, it’s surprisingly simple to transform that initial sketch into a polished drawing. My praise for the pen, however, is dampened by the downright clunky piece of software it interacts with. While Wacom’s Sketch Manager technically accomplishes a number of great things—you can separate drawings into layers after the fact, line by line; watch a timelapse of your sketch; and export it to other programs—it does so in the most technically incomprehensible, confusing, and counter-intuitive manner possible. I was tempted to throw my hands up in despair on more than one occasion. Simply put—the user interface is baffling. Though it performs technically advanced processes, it’s almost impossible to suss out how to do these things in the first place thanks to badly labeled icons, poor interaction design, and an organizational structure that makes me seriously wonder how much time was actually spent on the app. In fact, were it not for Wacom’s tutorial on the subject, I would have given up on the software’s abilities entirely, using it just to export to Illustrator to interact with my sketches. 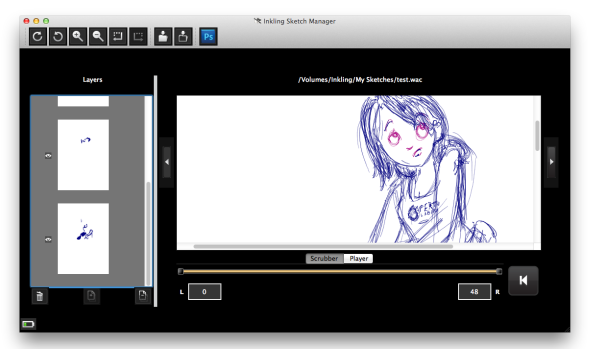 Dance ten, looks three: The Sketch Manager offers a lot of functionality, but in a poorly designed package. Not only is the software rough around the edges, but it's awful through and through. I can only make assumptions and guesses as to why this is: For one, though Wacom has long been a stellar hardware manufacturer, it’s only recently tried its hand at (non plug-in) software development; in addition, the Sketch Manager has to be compatible across multiple platforms, so the company probably wants to keep development costs down by changing the code as little as possible. Whatever Wacom's reasoning and limitations were, the result has produced a nearly unusable piece of software. Which is a shame: When every other aspect of your product—packaging, marketing, and function—is impeccably designed, but the software acts like a bull in a china shop, it damages an otherwise brilliant device. As an artist, I would use the Inkling daily. It’s comfortable to draw with, it’s an impressive digital tool, and the support for pressure-sensitivity and vector export easily trump the iPad as far as my sketch workflow is concerned. But the idea of having to work with that software to export anything stops me in my tracks. There is room for hope, of course: The Inkling’s a 1.0 product, and I have faith in Wacom’s ability to positively iterate. The hardware is phenomenally expressive, and the software’s abilities aren’t bad either. If the company can just bring some of its design expertise over to the software interface side, the Inkling could go from a neat idea to something quite special indeed.